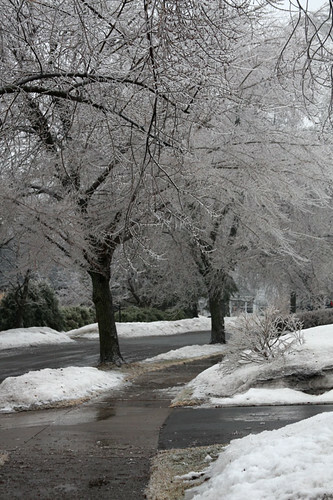 We were fortunate to have avoided the worst of the ice storm earlier this week. The North Shore was hit hard with downed trees and power lines. We had a only a few trees and some branches down in our area. No loss of power. 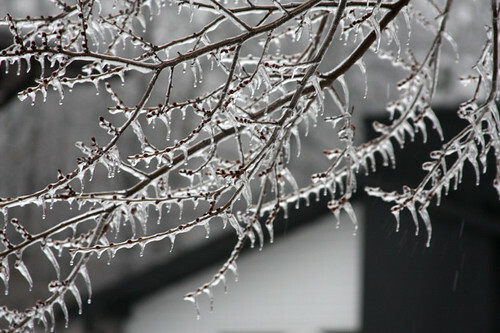 We snapped a few photos on Monday of the ice that had accumulated on the trees and other things in our yard. It was rather beautiful, but eerie at the same time. 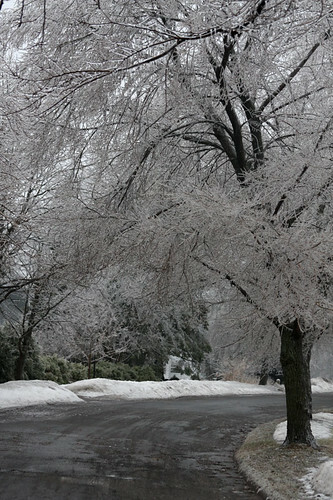 The crackling and snapping of ice falling off trees made me a little uneasy. Mike was having flashbacks to eight years ago when Sebastian was just a baby. We lost power for three days during an April ice storm. We braved the first day without power. Keeping a baby warm without heat and changing diapers in the cold was a bit much. No hot water was the last straw. We were fortunate to have friends just a mile away with power. They let us stay with them the next two nights and our neighbor across the street kept our freezer items for us. For some reason all of our neighbors across the street regained power after the first day. Those of us on the “other side of the tracks” had to wait two more days.